Living in the region so closely associated with the Hudson River Painters is a real bonus at this time of the year. The children are well aware of the beauty surrounding them and inspiration comes easily to them. This lesson was a quick forty minute lesson which involved many different mediums such as crayon, regular and chunky, pastel, and paint. Many concepts, and methods of application of the various mediums were introduced and reviewed. For instance we discussed the smooth texture we achieve when a crayon is rubbed on its side on paper. We also spoke about value and how we could get a light or dark shade by the pressure that was applied on the crayon. Before the trees were drawn the paper was folded in half and then black pastel was used for drawing the trees on the folded line. 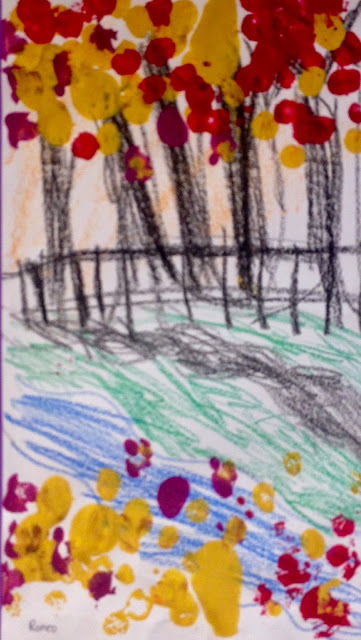 The bold pastel lines, the use of thick and think lines for branches helped to create a nice focal point for these pieces. Movement was also discussed and how it would look like a windy day if the branches of the trees were bent or curved. Students could either portray the leaves reflecting in a body of water or simply have them appear to be falling on the ground. 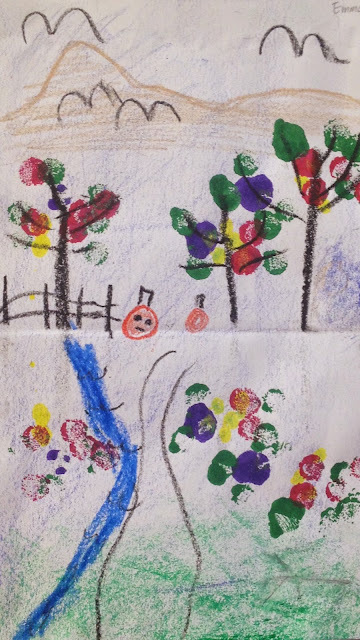 Other elements were added with crayon such as animals, roads, fences, pumpkins and mountains. The real fun began when I passed out pom pons clipped to a clothes pin. 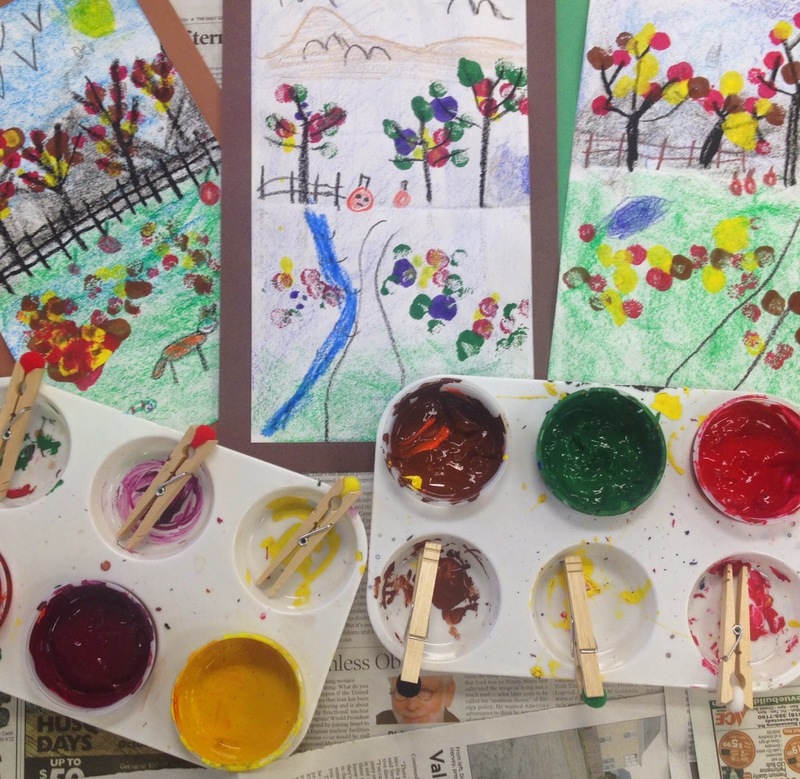 These became our painting tools when dipped in muted tones of paint. 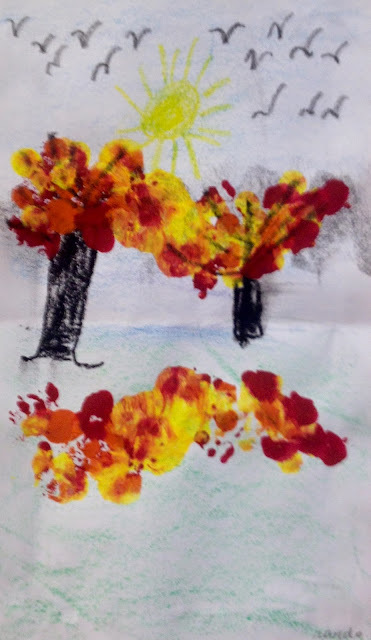 The children enjoyed dabbing the leaves on the branches of the trees and then quickly folding and pressing the wet paint onto the bottom of their paper creating a reflection. Janis - love this - it looks so much like something i would do, too, right down to the set-up of materials and the clothespins. We took a walk along the Hudson today, and I thought about the Hudson River painters - the landscape was filled with rich ambers and ochres and olives and umbers and golden light that reminded me of the paintings, and I said "I wouldn't want to live somewhere where this doesn't happen every year!" 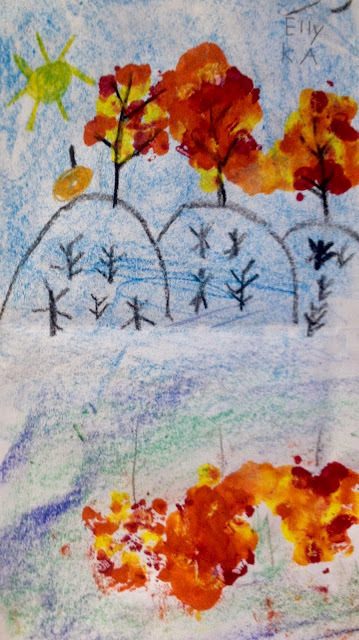 Thank you Phyl for so eloquently describing the colors of autumn here in the northeast. Your description certainly enhances my post. 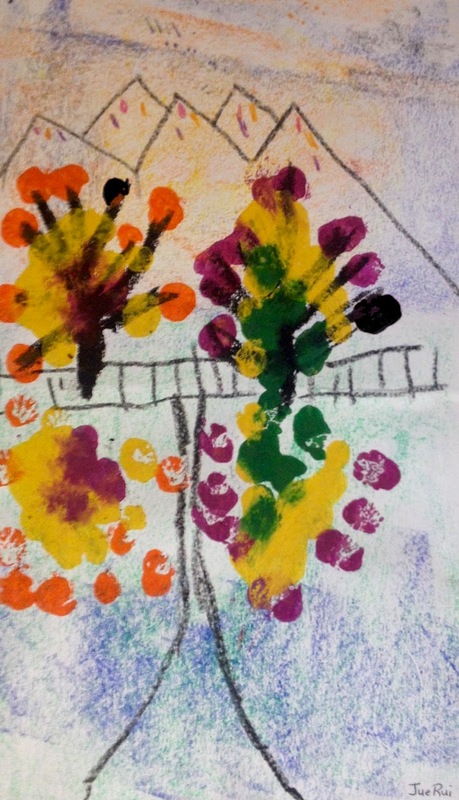 I am having a great year in my art room. Wish I was as good as you at posting the wonderful work my students do! Thanks for stopping by. Me again - are you going to NYSATA this year? Hope to see you!